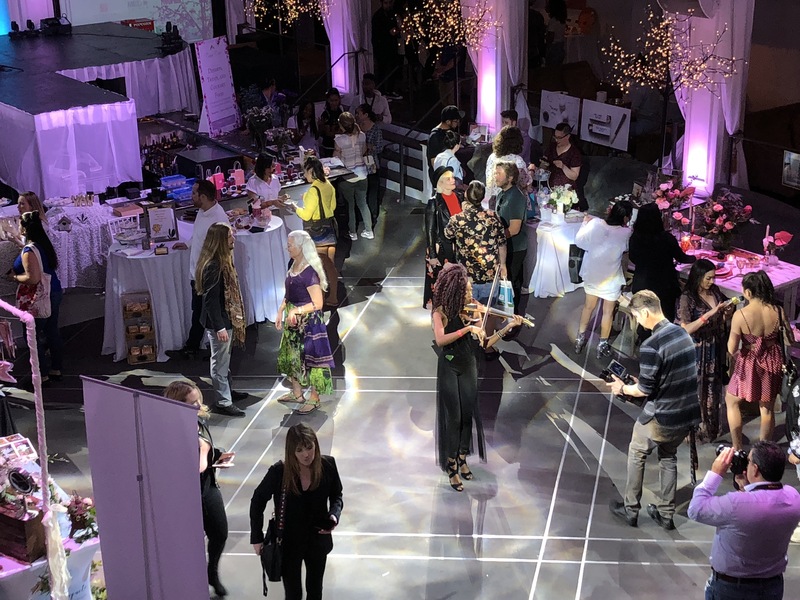 I’m always interested in all aspects of throwing a successful soiree, and that’s what the recent Cannabis Wedding Expo was all about. The main floor, with the female violinist in the center. Photo by Karen Salkin, as is the one at the top of the page. 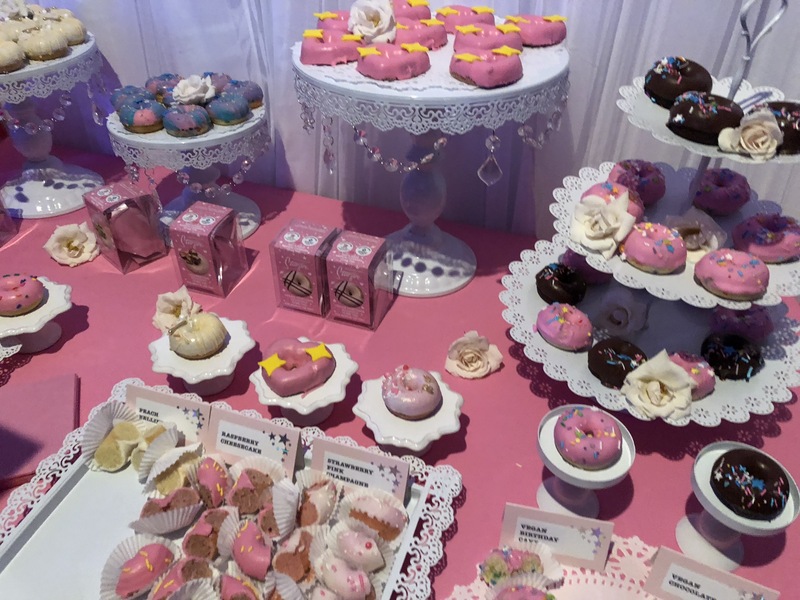 The Expo featured ideas for all kinds of parties, not just weddings. Some were even useful in day-to-day life. The “Welcome” fruit platter, with a hint of the goodie bags to come in the upper left. Photo by Karen Salkin. And these Expo organizers thought of everything—they even added the clever little touch of floating marijuana leaves in one of the shallow reflecting pools in the courtyard! They also did something sort-of charming, which I’ve never seen at an event before—as we entered, before we even received our goodie bags, there was a platter of colorful fruit for us to begin our day with. That was a breath of fresh air for an event that started in the morning. The most popular vendor of the entire event was Royal Treatment Wellness. I love that their slogan is “Treat your body like royalty!” Antone Murray’s company was doing massages and facials all day, which is exactly what my friend and I needed right about then. 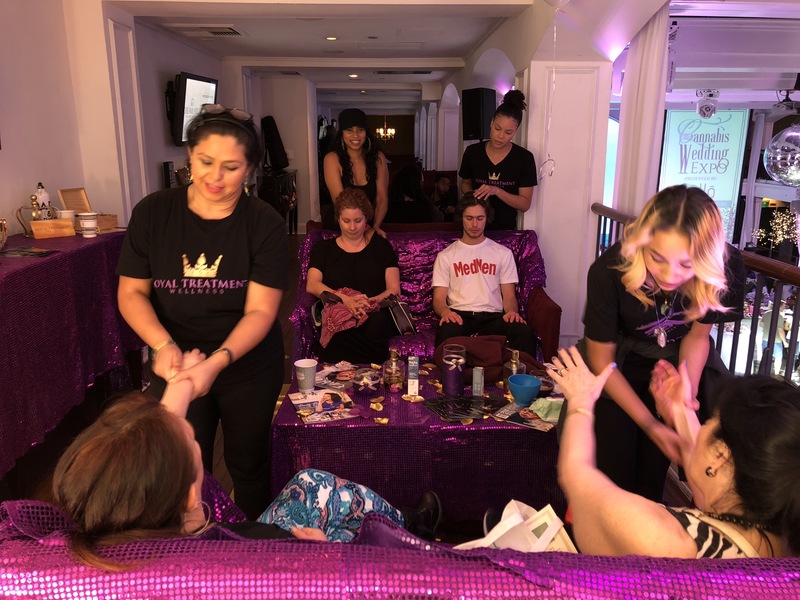 We both received very relaxing arm, hand, and shoulder massages—mine from Marlene Sanchez and hers from Melanie Tovmasian—done with infused oils. We enjoyed the massages immensely, with my friend telling me that she actually had more energy for the rest of the day, and a much higher appreciation of what that particular type of oil can do. 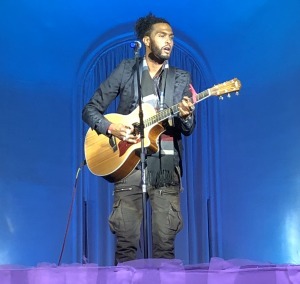 Aquile. Photo by Karen Salkin. There was wonderful musical entertainment along the way. Crissy J, a female violinist accompanied instrumental tracks, performing from the middle of the dance floor, and then later on, fabulous singer Aquile, serenaded us from high up on the stage. His sound reminded me of Shawn Mendes, so I hope he gets as well-known, and soon! One of the photo booth pix of Karen Salkin, who’s showing how her bracelet collection matches her hip and happening pants! 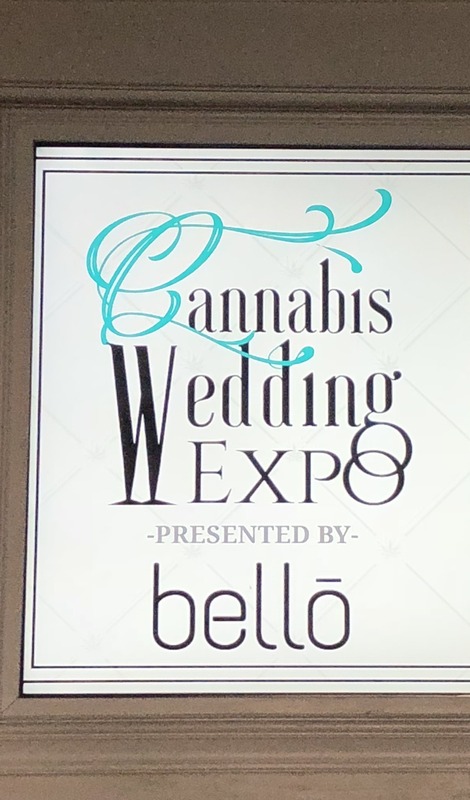 Another bonus was that the Cannabis Wedding Expo was populated by what seemed to me to be upbeat and polite guests. It really did feel like a party, which I really appreciated. It put my friend and me in such a good mood that we even took party pix in not one photo booth, but two! I think that’s a first. We had tons of fun, and so can you, in the next cities it visits, or back here in Los Angeles next year. You don’t even have to be getting married to participate!